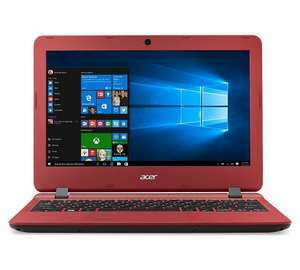 Powered by an Intel Processor, this Aspire ES 11 notebook is an all-round companion, featuring Acer BluelightShield and a Precision Touchpad. The Acer ES 11 comes equipped with free 1 year Office 365, ready to work on your documents. Tap, swipe, scroll, and zoom through your day with precision touchpad. Palm rejection technology and pinch-to-zoom capability means you'll always be in control. Also, preserve your sight and turn on the Acer Bluelightshield feature in the Acer quick access tool bar. This sophisticated technology reduces blue light emission from the backlit module and allows you to use your computer for a extended period of time with reduced eye strain. Includes Office 365 Personal 1-year subscription and 1TB Microsoft OneDrive cloud storage: Value of £59.99 ERP. Activation required within 6 months of Windows activation date. Intel Celeron dual core processor. Intel HD Graphics500 graphics card.